Simon Cowell and his dogs Squiddly, Diddly, and Freddie have teamed up with Cruelty Free International to get dogs out of laboratories around the world. Tens of thousands of dogs are imprisoned in laboratories around the world. Many will never see the sky, breathe fresh air or feel grass beneath their feet. Instead they will be forced to spend their lives inside a laboratory, where they can be injected with or force-fed substances - such as drugs, pesticides and weed-killers. This can result in horrific effects such as vomiting, diarrhea, internal bleeding, organ damage, seizures, paralysis and even death. Tragically, those who survive the experiment will usually be killed anyway. Dogs are not and can never be substitutes for humans. They react differently to humans given the same drugs, so the results obtained from poisoning beagles is of little value to people. A ground-breaking scientific study carried out by Cruelty Free International and FRAME has shown that using dogs to predict how humans will respond to drugs is not scientifically justifiable. Armed with ethics and science on their side Cruelty Free International is placing the use of dogs in experiments on the global political and public agenda of key countries around the world, including the US - one of the world's biggest users of dogs. The latest statistics available reveal that 59,358 dogs were used in experiments in the US in 2014. That number rises to more than 65,000 when also counting the number of dogs held in US laboratories for breeding or future use. 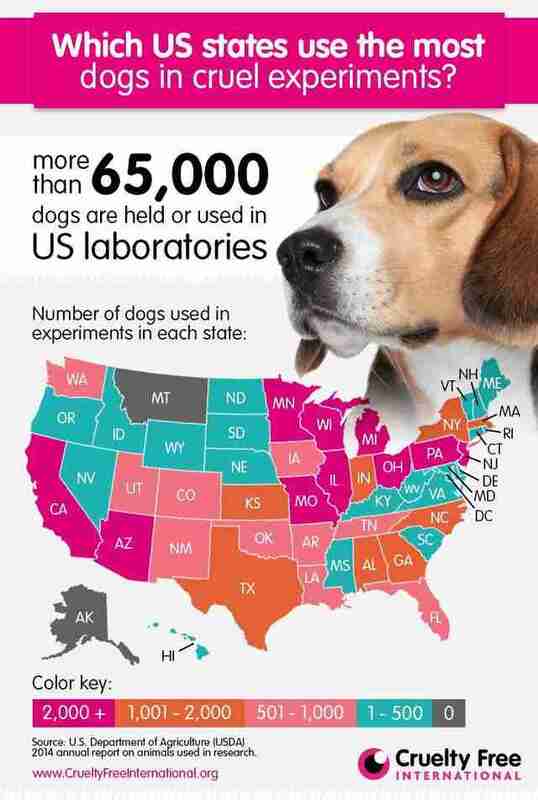 Compare this to 3,553 dogs used in experiments the UK in 2013, and 17,896 dogs used in experiments across the European Union in 2011, and it becomes clear that US laboratories have a big appetite for dogs. The number of dogs used in the US varies greatly between states - take a look at the infographic below to compare. Due to the secrecy that surrounds animal experiments, the use of dogs in laboratories is something the US public and politicians know very little about. With some help from Simon Cowell, Cruelty Free International is changing that. Find out how you can help.